A Chart Shewing part of the Coast of N.W. America, with the tracks of His Majesty's Sloop Discovery and Armed Tender Chatham;; Commanded by George Vancouver Esq. and prepared under his immediate inspection by Lieut. Joseph Baker in which the Continental Shore has been traced and determined from Lat: 46.30 N. and Long236.12 E. to Lat: 52.15 N. and Long . 232.40 E. at the different periods shown by the Tracks. This is a hand colored 1871 reissue of what is considered to be the great navigator George Vancouver's most important and influential map detailing the northwest coast of America. Originally issued in 1798, Vancouver's map covers from Cape Lookout (modern day Oregon) northwards past the Columbia River, the Strait of Juan de Fuca, Vancouver Island, Queen Charlotte Sound, to Cape Swaine (Alaska). 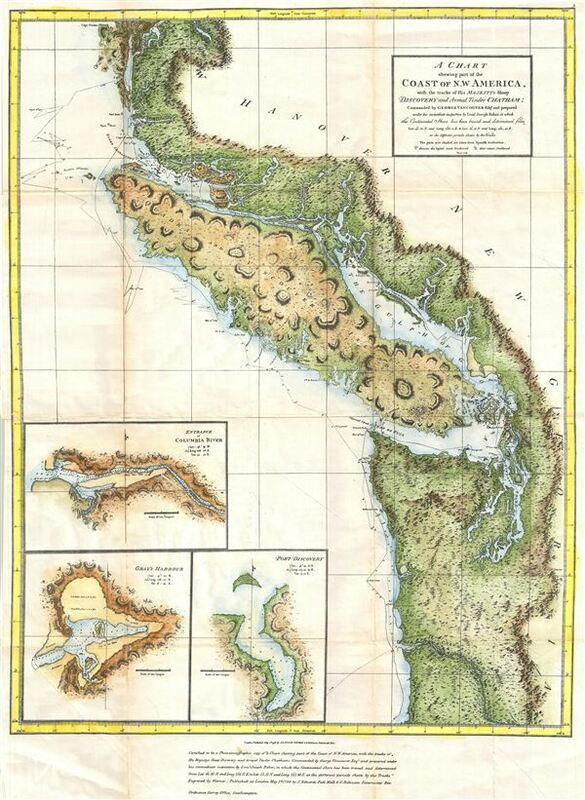 This beautifully drawn map features a number of notable firsts, including the first published map of the Puget Sound, the first mapping of Vancouver as an Island, and the first mapping of the Johnston Strait. Mount Rainier, Mt. St. Helene, Mount Baker are all noted. Inset maps in the upper right quadrant detail Cape Gray and Port Discovery. Another inset in the lower left quadrant focuses on the mouth of the Columbia River, soon to become a major artery for the fur trade.